Bruxism, or the grinding and clenching of teeth, is a subconscious condition that commonly occurs at night and can often prevent you from receiving a good night’s sleep. In addition to a lack of sleep, excessive grinding and clenching throughout the night can also lead to headaches, jaw discomfort, neck and shoulder pain, and even severe tooth damage. Fortunately, bruxism can often be treated with a nightguard designed to fit comfortably over your teeth as you sleep. At the Art of Dentistry, our experienced dentist, Dr. Robin Rutherford, can custom-design a nightguard for you based on the specific size and alignment of your teeth. A properly fitting nightguard can help you reduce grinding and clenching, prevent tooth damage (including chips, breaks, fillings fractures, etc. ), alleviate headaches and muscle aches, and enable you to wake up in the morning feeling rested and refreshed. 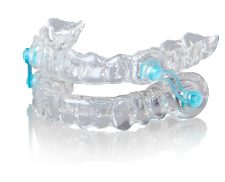 Nightguards from Dr. Rutherford are typically composed of a soft, durable material designed to absorb the force and strain put on your teeth and jaw muscles from bruxism. Fabricated to fit comfortably over your teeth, your nightguard will help to restrict your chewing muscles from engaging throughout the night, ultimately preventing your teeth from touching and grinding against one another. By wearing a customized nightguard, you can effectively break your bruxism habit and receive the good night’s sleep you deserve. For more information on bruxism treatment with nightguards, please contact the Art of Dentistry to schedule a consultation with Dr. Rutherford today.